“You can, you should, and if you’re brave, enough to start, you will” is one of the Cayman Islands Crisis Centre’s mottos. An attitude which also applies to tough, action sports like Kite surfing, Paddle boarding and Wakeboarding which is why WATERMAN Surf Company in association with the Rock International Open has put together an event just for females, to show women of all ages and fitness levels that they have no idea how strong and capable they are. Ride Like a Girl aims to give participants a taste of watersports which can appear inaccessible to some, for either financial or fitness reasons, and bring together a new community of women who want to have a good time at the beach, enjoy the outdoors and motivate each other. The event is due to take place on Sunday 14th December at Barkers National Park and Public beach and offers an array of watersports (kitesurfing, stand up paddle boarding, wakesurfing) as well as beach yoga, beach games and a closing BBQ at Calico Jacks. Registration is just $60 and includes and event tee shirt and a donation to the Cayman Islands Crisis Centre. Maya Lewis, Amy Strzalko and Kiristen Cousins are all team riders for WATERMAN Cayman Surf Company and sponsored by Best Kiteboarding, Slingshot Kiteboarding and Coreban Stand Up Paddle boarding respectively. By hosting this event they hope to share their passion for their chosen sports whilst raising funds and awareness for a good cause. 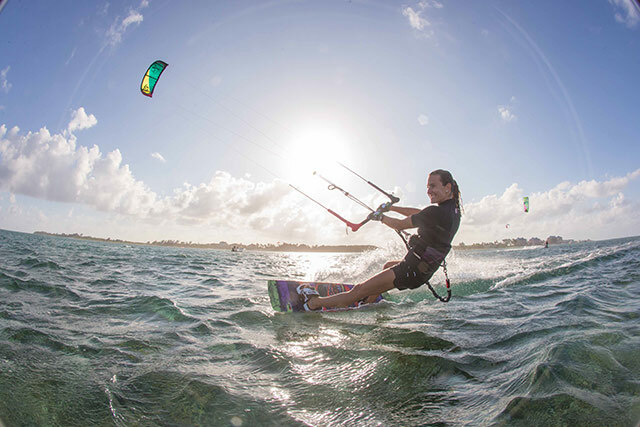 “I love seeing other girls getting stoked on kitesurfing.” Continued Strazlko. International team rider for Slingshot kiteboarding. “When I started kitesurfing I dreamt about being sponsored and just over four years later I’m living my dream. Ride Like a Girl has already received a tremendous response with over 20 women already signed up and both local companies and international brands have jumped at the opportunity to sponsor and partner with this groundbreaking event. Sponsorship packages are still available and all funds raised will be donated to the Crisis Centre.